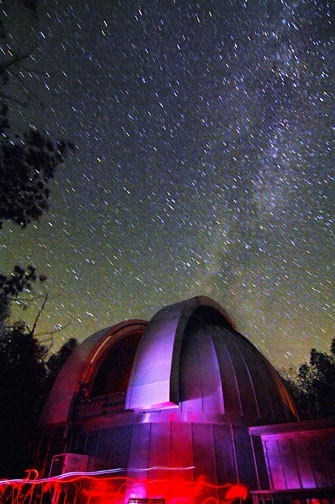 The Dark Sky Observatory (DSO) is the research facility used by ASU astronomers and their students in a number of research projects. It is equipped with four telescopes, each used regularly for CCD imaging and photometry, with spectrographic instrumentation also available at the 32-inch. With the completion of the Visitor Center we will begin a program of public observing sessions. Thanks to Todd Bush for the image at left! 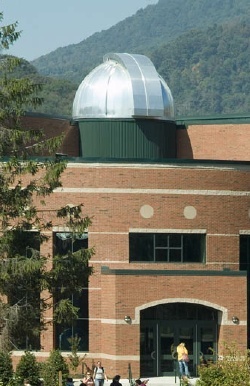 The Rankin Science Observatory (RSO) is used to introduce students to observational techniques. The facility shown at right is our new building that replaced the oldest wing of the Rankin Science complex. The new dome houses a 16-inch telescope. The old dome has been moved to the Dark Sky Observatory where it will eventually be used for another application. Photo at right by ASU photographer Mike Rominger.